1. Heat the oil in a frying pan and fry the mushrooms for 2-3 minutes, add the Worcestershire sauce, soup and cream cheese and simmer for 2-3 minutes. 2. 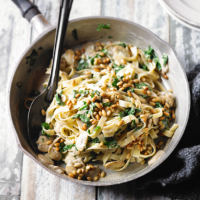 Meanwhile, cook the tagliatelle and spinach in boiling water for 5 minutes, drain and toss into the mushroom sauce with the pine nuts, season to taste.